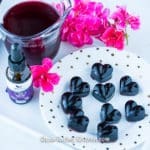 These Homemade CBD Gummies for sleep are so delicious and easy to make. They can naturally help improve sleep quality. What is CBD and is it Legal to Use? First off, you might be wondering what CBD is and is it legal to use? CBD is short for cannabidiol, and is one of the numerous cannabinoids that come from the hemp plant. CBD differs from marijuana because it does not have any psychoactive effects. CBD products are legal at the state level because they are derived from hemp and contain less than 0.3% THC. For more detailed information about the manufacturing process and medical uses of CBD oil, you should check out the interview I did with the Medterra CBD oil CEO, Jay Hartenbach. Now that we’ve covered that issue, let’s talk about the benefits of using CBD oil. CBD has been studied extensively around its anti-inflammatory benefits. In regards to sleep, there was an interesting literature review published about the possible benefits of CBD in the treatment of insomnia. CBD also has research supporting its use in managing or resolving autism, anxiety, epilepsy, and migraine, among many other disorders and symptoms. Trying CBD oil for yourself is one of my top eight ways to sleep better. There are a lot of CBD gummies and edibles on the market. Since I’m so picky about the quality of ingredients I use, I decided to try making my own CBD Gummy for sleep. It’s actually super easy and kinda fun, so that’s why I’m sharing the recipe with you. Also, it’s more affordable to make your own! 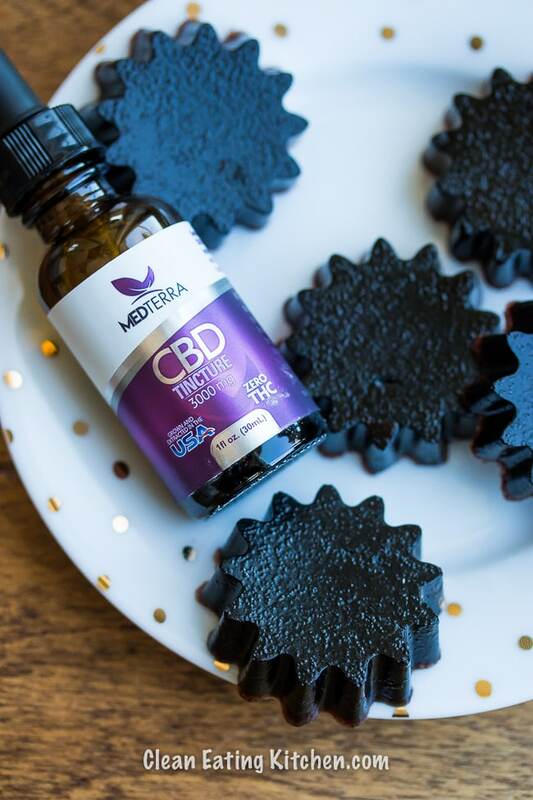 If you prefer to just buy a CBD product to help with sleep, you should check out Medterra’s CBD sleep capsules that include CBD and melatonin. They’re great, too. Use code CLEANEATING for 15% off your order at MedterraCBD.com! Tart Cherry Juice is an amazing supplement (I buy this organic tart cherry juice concentrate with no added sugar or preservatives). Tart cherries have also been studied for their anti-inflammatory properties, and benefits on sleep quality, especially in people who are already having a hard time with sleep. Tart cherry juice is not only health-promoting, but it tastes great! 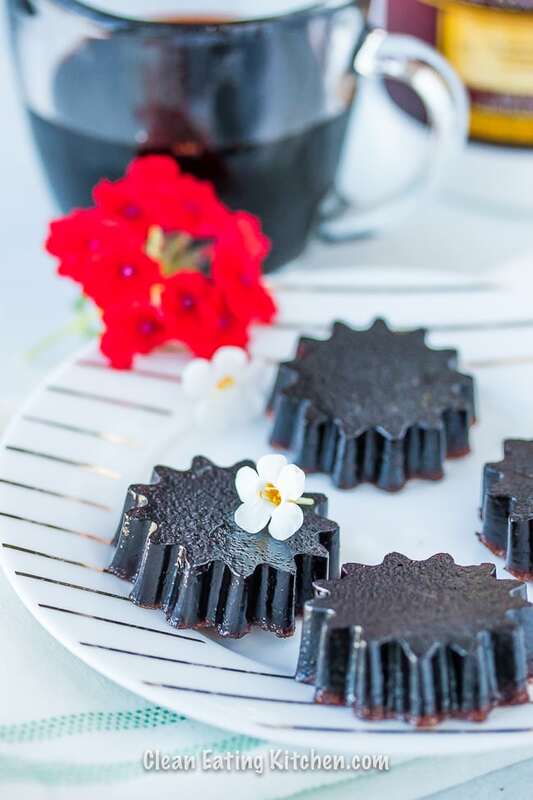 It is tart, yes, but you’ll see I off-set some of the tartness with raw honey in my CBD Sleep Gummy recipe below. The obvious next question is which CBD Oil do I recommend for these CBD gummies? 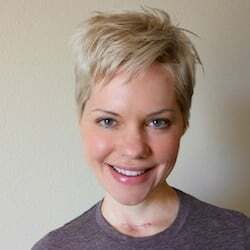 I’m an affiliate with the company called Medterra CBD, and there are a few reasons why I strongly recommend the CBD from Medterra. First, the products are all certified to be 100% free of THC. While some CBD products are known as full-spectrum and can contain trace amounts of THC, the CBD from Medterra has been lab-tested to be free from any THC. This means that you won’t fail a drug test and you likely won’t feel any negative side effects from taking Medterra CBD. Again, as always, you really should talk to a healthcare practitioner before adding any supplement to your routine. That’s because everyone is different and everyone has his or her own pre-existing conditions, medications, etc. To make the gummies, you’ll heat the juice in a saucepan just to a very light simmer. Next, whisk in the gelatin and the honey, stirring for about a minute until the ingredients are combined. Turn off the heat and add two milliliters of CBD oil. Give the mixture one final whisk. The last step is to pour the mixture into your mold. You can do this without spilling by transferring the mixture into a small pitcher. Divide the juice mixture evenly into your mold. Place the mold on a baking sheet and set it in the freezer or the refrigerator to set. Wait at least 30 minutes to one hour before removing the gummies from the molds. Store the gummies in the fridge for up to 10 days. Can CBD gummies help with anxiety? CBD does have research showing it can reduce symptoms of anxiety. But, it’s usually an individual thing and so you’ll just have to try it to see if it works to help with your anxiety. How long do CBD gummies take to kick in? 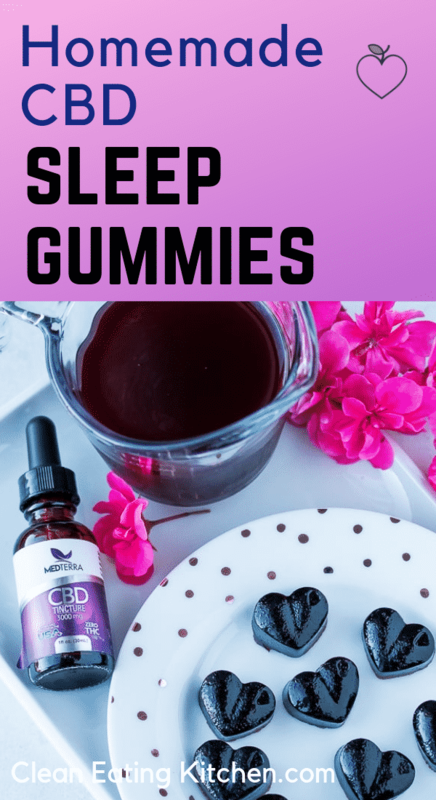 Allow at least 30 minutes for CBD gummies to help with sleep. Again, it’s a very individual decision to determine how many gummies you should take. I would recommend starting with the lowest dose and moving up from there. 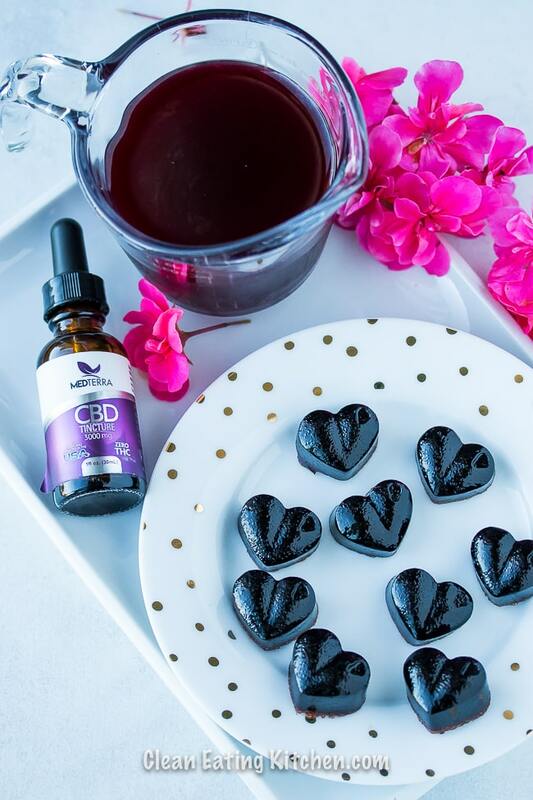 These Homemade CBD Sleep Gummies are so delicious and easy to make. Start by adding the juice to a medium saucepan over low heat. Heat the juice to a light simmer. The last step is to pour the mixture into your mold. You can do this without spilling by transferring the mixture into a pitcher. 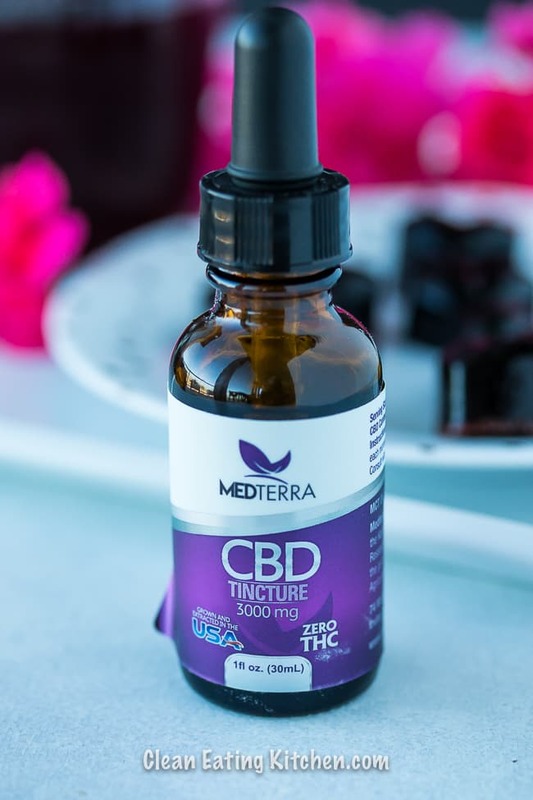 2 ml of the Medterra 3,000mg tincture includes 200mg of CBD. So, each gummy includes 20mg of CBD. Do not serve to children without asking your healthcare provider first. Pin this image to your favorite Pinterest board to save this recipe and article for later! Note: this is not a sponsored post, but it does contain affiliate links. I get a small commission on orders made using my links which help keep my blog going. Thank you for this recipe! I bought some CBD gummies for the first time today from a shop near my home in Washington and was shocked that they cost $3-4 each. That’s not sustainable! By my calculation it would cost just over $1 each to make them. Way more affordable. I’m curious about your insistence on there being no THC at all in the oil. The sales person said that a very low dose of THC tends to make the CBD more effective without making you high. Thoughts? Quick update: I also used this as a base recipe for making “tummy gummies” for my husband. I used 1 1/2 cups apple juice, 3 T gelatin, and 10 T Heather’s Tummy Fiber. This made roughly 30 gummies with 1 tsp each of Heather’s Tummy Fiber in them. We’ll see if he likes them better than drinking the fiber dissolved in water. One of my go-to recipes! Am I doing something wrong? I used 1 cup of grape juice instead of the cherry juice. It made way more than 10 gummies.it made 2 trays of the heart shape trays plus there was a little extra left over. I am using CBD gummies for headaches. I purchased them at a dispensary here in Oregon. These are made from hemp, so no THC. I am looking to make my own. Your recipe looks great but, I only have one question. Your recipe states they only last 10 days in the fridge. With the amount of gummies this recipe creates, how can you go through that amount in 10 days? I don’t understand why they would go bad after only 10 days? Can you explain please? Hi Lydia, you can freeze the ones you don’t use right away. The problem is that they can grow mold, even in the fridge. I would try to eat the ones in the fridge by 10-14 days, and then just freeze the 2nd half of the batch and de-frost when you’re ready to eat them. I tried to make gummies with CBD oil and they were oily and not mixed well, am I doing something wrong? I am new to cbd. I suffer from MS and want to make these. When you say 2ml for the oil is the tincture marked or is a full tincture 1ml. Hope I dont sound clueless. Hi Nana, the dropper is marked with lines. A full dropper is 1 ml. Does that help? CBD being an oil, when mixing it into the gelatin how can you regulate how much is in each gummie. I tried making and the oil did not mix in very well. I used pure CBD oil not an isolate. Kim, you would measure out the dropperful to get an idea of how much CBD is in each gummy. It should mix well if you whisk it when the mixture is warm. Is your CBD oil in an oil-based carrier? No carrier, pure CBD oil from Hemp. Is there a way to make this gummies last longer without having to freeze them ? No because they can get moldy even in the fridge. You could make a half batch instead. The cbd oil I use is 200mg per 30ml bottle. How much oil can I add before I completely destroy the recipe and gummy consistency? I’m not sure, but going up to 2 or 3 dropperfuls should be okay. Followed your recipe exactly and placed the filled molds in the freezer. After one hour the gummy’s had not set up. Please advise. What kind of gelatin did you use, Debby? You used gelatin and not collagen, correct? Gosh, I have no idea, Al. I think it should work, but I would try it with a very small amount and work upwards once you know that the gummies will gel.